This base cap and crown cap molding bit has a cutting height of 1-5/16" and cutting depth of 3/8". This bit is used to add a cap to base moldings and can also be paired with a horizontal cove Router bit to create large crown moldings. 1/2" shank. 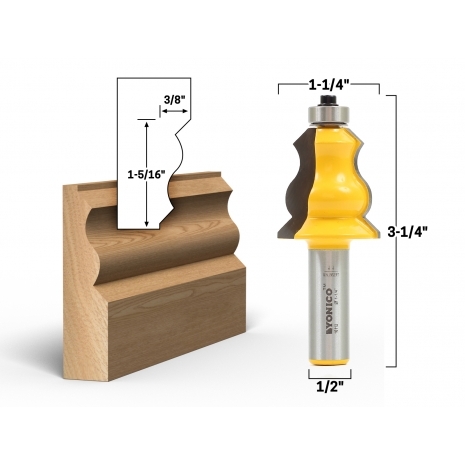 Pair this bit with one of Yonico's wide horizontal cove router bits to create crown moldings of up to 5-3/8" wide. This bit can also be used on its own as a base cap molding bit or a casing bit.